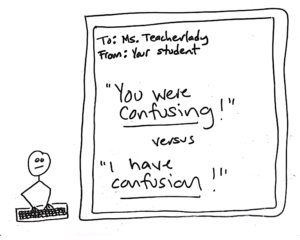 Do you ever need to email your teachers because something they did or said is confusing, and you need clarification? One of the skills I work on with teenagers is how to communicate respectfully with teachers without sounding like you are blaming or accusing them. This is a HARD lesson for many teens to learn and takes some practice. Listen in as I share a story about a recent young man (sophomore in high school) who caught himself writing some blaming language to his teacher, and figured out — all by himself! — how to correct it. One of the skills I end up working on quite often with students, that I hadn’t originally thought I would, is writing emails. And this week I was talking with one of my clients, and he needed to write an email to one of his teachers. He was walking himself through it, and while I usually walk my clients through the email writing process, this young man is a good communicator and his parents work hard with him to help him be a good communicator. Anyways, here’s something that he caught himself doing that I wanted to share with you. As you can see above we have a little image of my client typing up his email and what he noticed was that he was starting to write “You were confusing in class today”, but he stopped himself and rewrote it as “I have confusion about what we were doing in class today.” And this is something he said his mom drilled into him last year ad nauseam, the importance of not blaming the teacher with your language; regardless of whether you think it was the teacher’s fault or not. We want to try and take ownership as much as possible in our email communications, as we will get better help from our teachers if we are generous with our communication. So I just loved that he caught himself there and the truth is that “I have confusion” was very true, as he is confused, regardless of what the cause of the confusion is. And by checking his language and tweaking it so he took responsibility for his experience, he is much more likely to get help from his teacher now, and in the future. I hope this tip is helpful, and if you want more tips and advice on communicating with your teacher, please consider checking out my course, The Anti-Boring Approach to Powerful Studying™.